We caught up with Alpenglow Expeditions guide Sydney Duncan after a great day of powder skiing in Nat Geo Bowl this week. 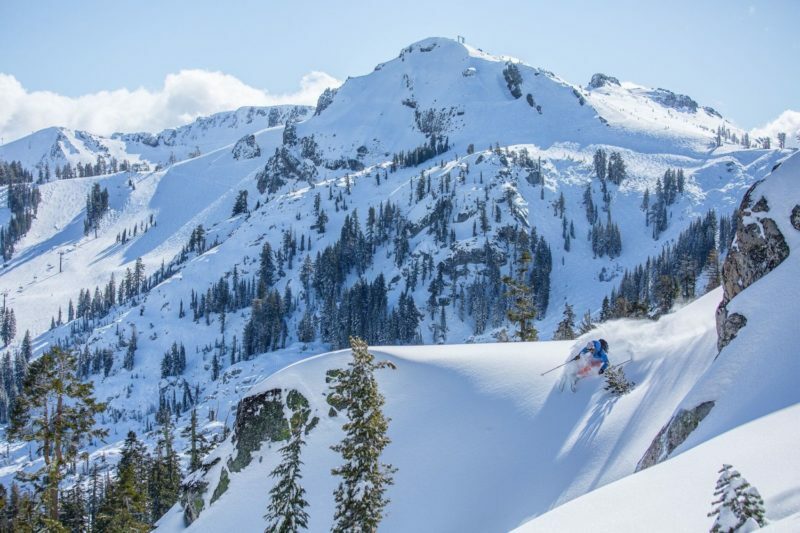 On Tuesday, Sydney, along with lead guide Logan Talbott, rode up the Granite Chief chair at Squaw Valley and left the boundary to head toward Granite Peak. They took their client to explore the terrain in Nat Geo Bowl and beyond to Needle Peak. With all the new snow this week, the coverage is great and the whole zone above 7,500′ is skiing well. Loving the 5″ inches of soft, light snow on top of a supportable layer, the group made smooth surfy turns right on top of the totally untracked snow surface. After a solid day of pow skiing, the crew came in with ear-to-ear grins (making everyone in the office very jealous!). Sydney is one of our newer additions to the Alpenglow Expeditions guide team, but she’s been working in the snow for the past 3 seasons and has a long history of guiding (on the water!). 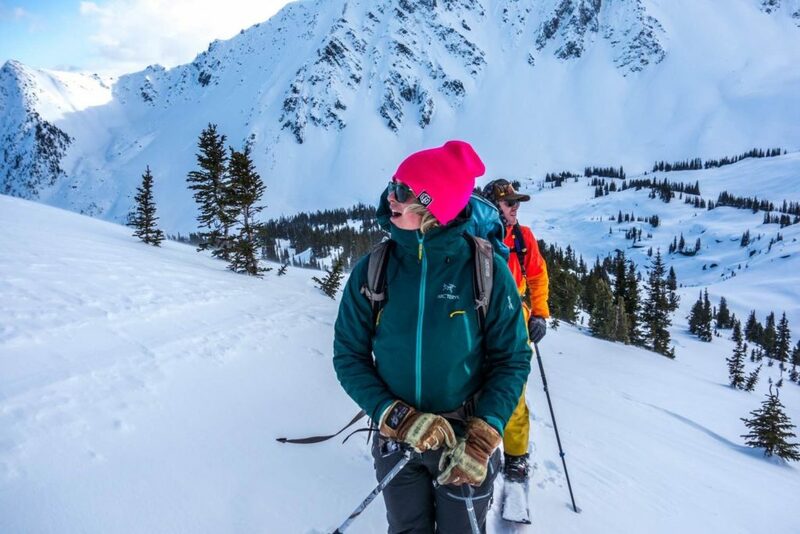 We’re really pleased to see more rad females out there guiding in the mountains. Sydney joins our female guide crew including high-altitude guide Carla Perez and splitboard guides Iris Lazz and Tailer Spinney. Q: Hey Syd, tell us about your path to becoming a ski guide. I have loved skiing my entire life. I started when I was 3. Growing up in Colorado it was just part of life. When I turned 18 I started my guiding career as a raft guide and became enamored with working in the outdoors. For years I have honed my backcountry skiing skills in France, Idaho, Colorado, and Tahoe, and I’m so happy to be able to share my love for human-powered turns with others. I’ve worked at Squaw Valley on Ski Patrol for 3 seasons and guiding was a natural progression. Recently I was accepted to the AMGA’s Ski Guide track and in March I will be starting the path with the Ski Guide Corse. It will be held at Red Mountain Pass outside of Silverton, CO. Three years ago I spent a winter backcountry skiing around those mountains. I feel so lucky to be able to go home and learn in my own backyard of the complex and grand San Juan Mountains. Q: What’s one of your favorite places in Lake Tahoe to ski guide? I love working and skiing in Nat Geo Bowl. It is a diverse zone with everything from soul-satisfying low angle tree runs to high adrenaline steep bowls and everything in between. It’s amazing to be able to show clients such a special place all within a short walk from the lift. Working at Squaw on ski patrol I have been able to scope the zone from the top of Granite Chief Peak, but being able to explore and guide clients has been a dream come true. Q: Tell us about the conditions in Nat Geo this week? Conditions in the Sierra are constantly changing and I’m happy to report that with these back to back storms Nat Geo is filling in nicely. We’re coming out of low-tide and getting into our mid-season snowpack. Logan and I went out on Tuesday to find beautiful buttery turns past Nat Geo on Needle Peak and the snow up high is staying nice and cold. I foresee the next couple weeks being pretty epic. Q: What’s the terrain like/ How’s the scenery? It’s truly an amazing zone. Although you get off a lift from Squaw it really feels like you have been dropped deep into the backcountry. We had clouds moving in and out on Tuesday and every time we got a little window the scenery was breathtaking. You can see Tinkers Knob to Castle Peak and on a clear day all the way to Lassen and Shasta. It doesn’t get much better than that. The terrain is impressive, to say the least, and it really has the goods for every level of skier from professionals to people who are out for their very first backcountry tour. Q: What’s the weather forecast look like? More snow?? It is looking good for Tahoe we have three systems that and moving in one after the other. Right now the forecasters are debating on the snow totals for the next week but it should be stormy from the 13th-19th. You can’t really ask for better news out here! super minor, but that photo that says “granite chief” is in the background has Emigrant Peak in the background. You can see the gas-x that’s above the roof on its top.